Registered Financial Planners (RFP) Philippines, the premiere professional organization of professional financial planners and advisers in the country, is holding the 7th Financial Advisors Congress on September 22, Saturday. The annual event provides a platform for finance professionals and investors to network and learn from leading experts and each other. More than 1,000 financial advisers, professionals and investors—people who offer financial advice or sell financial products—are expected to attend this year’s event. The number of participants this year is seen to surpass the previous years’ attendance. The event will take place at the JY Campos Hall in Bayanihan Center in Pasig City, from 1 p.m. until 5 p.m. The roster of speakers include John Mangun, columnist at BusinessMirror; Jonathan Ravelas, first vice president and chief market strategist at BDO Unibank; Marco Tarog, business development officer at First Metro Securities; Ryan De Vera, founder of financial consultancy firm Wealth Builders Asia; and Tony Herbosa, founder of online stock traders community Traders Apprentice Pilipinas. The speakers will talk about effective wealth-building in general and share their insights and expertise on the latest trends in wealth management in the country, as well as how to profit from the current financial and economic turmoil involving stock prices, interest rates and inflation. There will also be a discussion on choosing the right investment strategy and a session on value investing as a potential investment technique. Apart from investing, the event also aims to provide business insights especially on sales and marketing tactics to effectively grow client base. Ticket prices range from Php500 (early bird) to Php5,000 (regular) plus corresponding fees. Sales for the discounted rate of Php1,200 lasts only until September 15, Saturday. 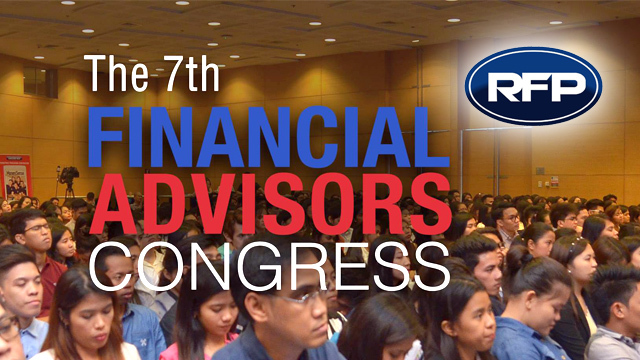 Click here to know more about the seventh Financial Advisors Congress. Tickets are available here.